Not a single bias edge in sight! 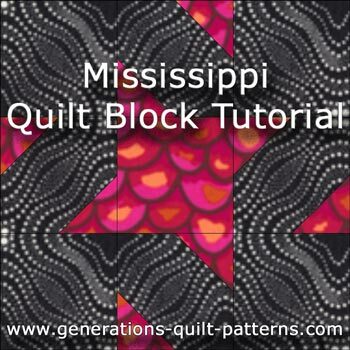 The Mississippi quilt block is a simple variation on a nine patch that uses the connector corners technique. 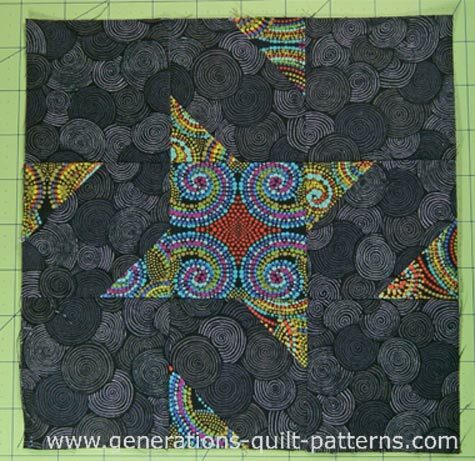 Unlike the Friendship Star block, a close look-a-like, there are no triangles to cut, no bias edges to contend with, which makes this is a terrific little block for a beginning quilter. So grab two fabrics and let's get started! When pressing, first press the pieced unit flat to set the seam. Then open the patches, pressing from the front. 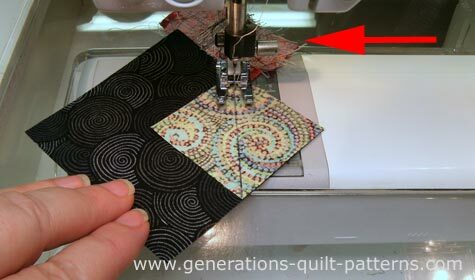 Take a minute to review our favorite 'secret' technique to getting the flattest quilt blocks you'll ever see. For stitching on the drawn lines, I like to use an open toe applique foot because it's easier to see where the needle should to go. Switch back to a standard quarter inch foot to sew the seams. The connector corners technique uses squares to create the 'half-square-triangle' look without messing with bias edges. The tradeoff is it takes a bit of extra material. The same sized patch is used for the units with the connector corners and the solid corner squares. 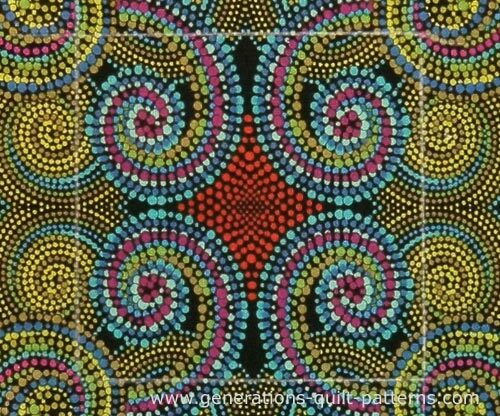 Choose fabrics with a high enough contrast so that the points of the star don't get 'lost'. Choose a finished block size from the chart below and cut your patches. 1 A 1 2”x2” 2½" x 2½" 3½" x 3½" 4½" x 4½"
2 B 8 2”x2” 2½" x 2½" 3½" x 3½" 4½" x 4½"
3 A 8 1-1/4”x1-1/4” 1½" x 1½"	 2”x2”	 2½" x 2½"
Unfinished Block Size 5” 6½" 9½" 12½"
Midpoint 1” 1¼" 1¾" 2¼"
These are some of the supplies I use to prepare and cut my fabric. To create this block, you'll need to make four connector-corners units. On the back of the eight small squares, draw a diagonal line from corner to corner. Mark just dark enough so that you can see the line to sew on. I like to use a mechanical pencil because the mark stays so fine. Each unit takes one #2 and two #3 patches (shown below). With right sides together (RST), align a #3 square with a #2 square. The drawn line touches two adjacent corners. In the photo below, you can see that I like to start stitching on a scrap of fabric (red arrow); then feed in the patches to sew. There's less chance for my machine to 'eat' the edges. It's easy to see where to stitch with an open toe applique foot. With a scissor, trim away the excess fabric of the smaller square between your stitching and the corner, leaving a quarter inch seam allowance. Ideally all the cut edges line up after pressing. But quilters are human and it's not always the case. If the edges of the smaller #3s extend a smidge past the large #2 patch, trim them with a scissor. If there's a big overlap, check to see that you're drawing a fine line exactly down the diagonal center of the square. 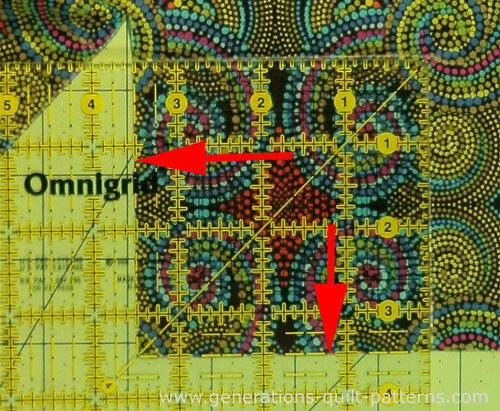 NOTE: The Mississippi quilt block design is entirely forgiving—you don't need to worry about the star points matching up to anything later on. As long as there's enough of the small #3 patch in the seam allowance, just keep going. That's what makes this a great block for practicing the connector corners technique. Repeat for a total of four units that look like the one above. Lay out your patches paying careful attention to the orientation of the stitched patches. Stitch into rows. Press the seam allowances toward the solid squares to minimize the bulk. For sewing the patches together, I've switched to my standard quarter inch presser foot. Your finished Mississippi quilt block looks like this. Your finished Mississippi quilt block! 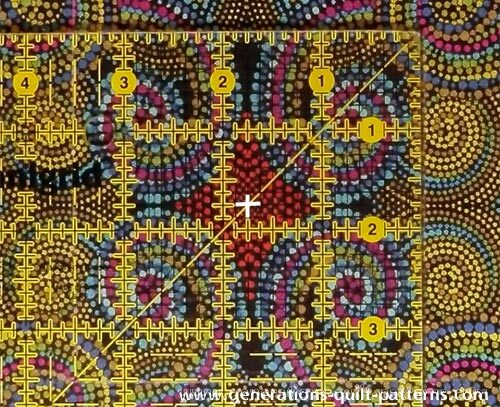 Now you don't think that red diamond appeared magically in the center of our Mississippi quilt block, right?! 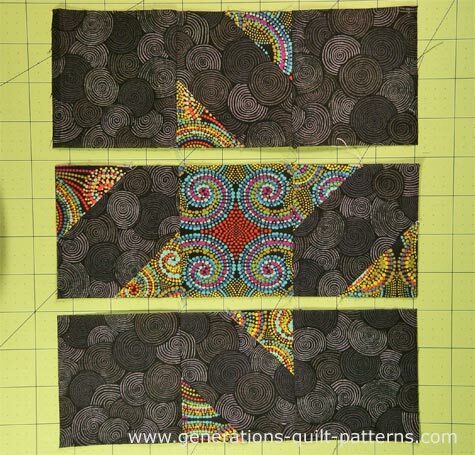 If you're willing to make Swiss Cheese out of your fabrics, consider fussy cutting the center square #1 to add a little interest to this otherwise simple patchwork design. First you'll need the 'Midpoint' number. In the cutting chart, locate the row, 'Midpoint' and and column, 9" (because our sample block is a 9" finished block). Click here to see it. For this block the midpoint is 1-3/4". 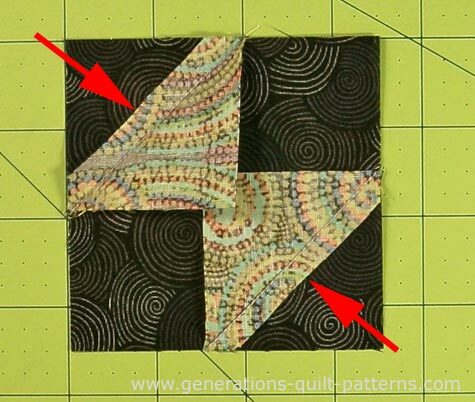 Simply center this point on your ruler (white +) over the center of the design you want to capture from your fabric. If you're short on fabric, I suggest drawing around the intended #1 square with chalk—the old measure twice, cut once trick! That way you can make adjustments before actually cutting into your precious fabric. Now cut the first two sides of the patch. Match the 'patch size' lines of your ruler (red arrows) with these two cut edges and finish cutting your #1 patch. For this 9" finished Mississippi block, The #1 is a 3-1/2" square. For more information on this technique, click here to go to Fussy Cut for Effect. 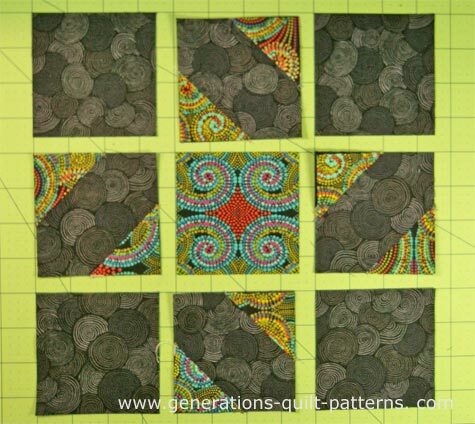 There's more blocks for you to try in our Free Quilt Block Patterns Library. Click here go there now! 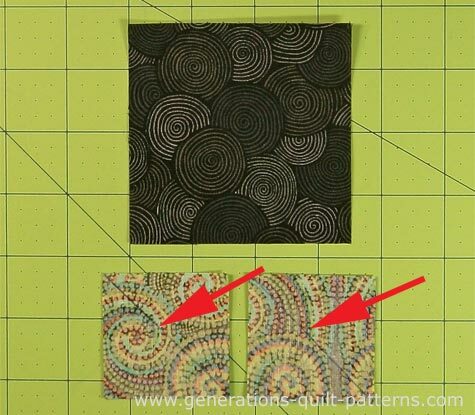 These are my go-to resources for quilt block ideas. 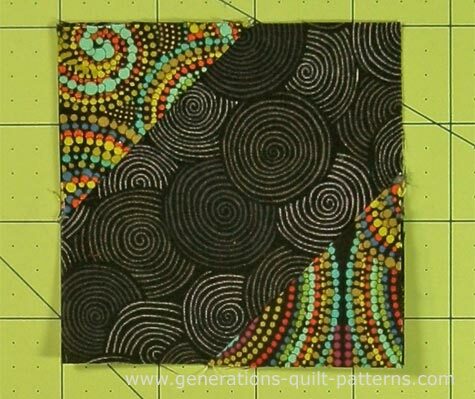 Maggie Malone's 5500 Quilt Block Designs is my all-time favorite quilt block resource! It's got a ton of blocks. 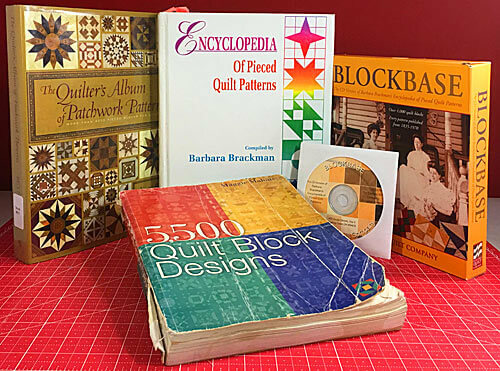 Next on my 'must-have' list is Barbara Brackman's Encyclopedia of Pieced Quilt Patterns. Unlike the Maggie Malone book, the blocks in this volume are hand-drawn and in black and white—no color—personally, I prefer colored drawings to work with. This book is no longer in print. If you can come by a copy expect it to be wickedly expensive. BlockBase is the computerized version of the Encyclopedia. 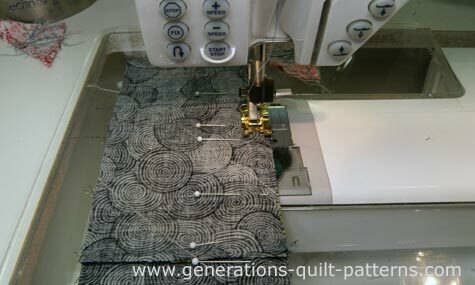 It can be used with Electric Quilt and is a Windows based program. 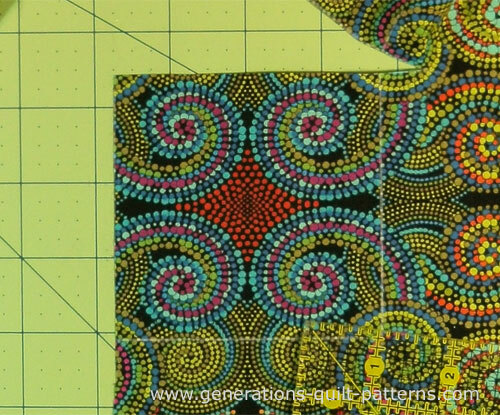 Finally there's The Quilter's Album of Patchwork Patterns by Jinny Beyer. Lots of detail and in color, it is a beautiful volume. That said, I check it out of my local library on a regular basis instead of purchasing it—can you see the library sticker on it's spine. Yep, it's from the Plainfield Public Library. Simply because I own the previous three references and find this the least user-friendly of the group. It does make a fabulous coffee table book though.